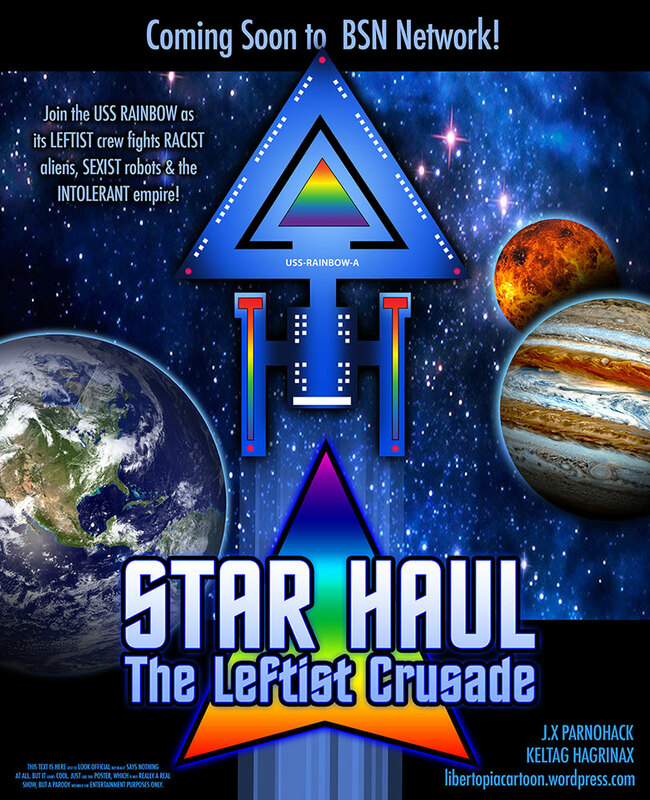 Galactic Imperium News Service Exclusive: Star Haul: The Leftist Crusade is an upcoming American television show created by Cryan Duller and Dalex Hurtzman for the BSN All Axis Network (no relation to Bryan Fuller or Alex Kurtzman, creators of Star Trek: Discovery). Along with the controversial and highly anticipated “Evil South”, another show developed by BSN Network, Star Haul is planned for a Fall release. The first Star Haul series since Star Haul: Deep Space Six concluded in 1997, The Leftist Crusade is set roughly 5 days before the events of Deep Space Six and will be set in the alternate X-2 universe where a super secret race of purple Kling’ums is terrorizing the galaxy. Note, this post is intended as a parody or satire in regards to Statism and leftism in popular media. Thoughts on parody graphics, Star Trek, Star Trek The Next Generation, Star Trek Deep Space Nine, JJ Trek, or Babylon 5 (gasp)! Leave us a comment! We love chatting science fiction! Enjoy cool graphic design or awesome artwork? Check out the rest of our site for libertarian artist interviews and more! This entry was posted in Uncategorized and tagged Alex Kurtzman, aliens, awesome artwork, Babylon 5, Bryan Fuller, capitalism, christianity, conservatism, cool graphic design, crystal powered, current events, Deep Space Nine, diverse cast, Free Market, Galactic Imperium News Service, George Donnelly, george takei, intolerant, JJ Trek, leftism, leftist, leftist crusade, Libertarian, libertarian artist, libertarianism, parody, parody graphics, popular media, propaganda, racist, robots, satire, sci-fi, sexist, social commentary, star haul, star trek, star trek the next generation, Star Trek: Discovery, star wars, statism. Bookmark the permalink.